All our fall foliage is gone, so I decided to have a lazy weekend at home. My camera only came out of its bag to take photos of food. (and I cooked a lot this weekend!) 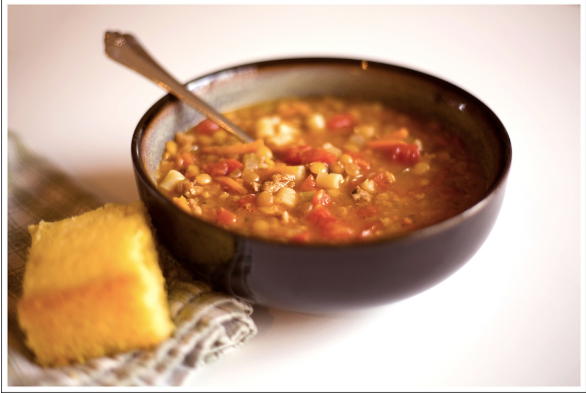 On Sunday morning, I made a big pot of lentil and sausage soup and a pan of sweet cornbread. It will be my lunch for most of the week. I've heard it said that no self-respecting Southerner puts sugar in their cornbread. There must be some truth to that, because I actually grew up hating cornbread because I thought it always tasted gritty, dry, bland and crumbly. Then, about ten years ago I had cornbread at a restaurant in Maine. It totally changed my mind about cornbread. Now, I love it... but it has to be sweet, moist and almost cake-like. Both of these dishes followed new recipes, and both were excellent!